Figure 1. Target map of the PathScan® Intracellular Signaling Array Kit (Fluorescent Readout) #7744. Figure 2. MCF7 cells were grown to 80% confluency and then serum starved overnight. Cells were either untreated or treated with Human Insulin-like Growth Factor I (hIGF-I) #8917 (100 ng/ml, 20 min). Cell extracts were prepared and analyzed using the PathScan® Intracellular Signaling Array Kit (Fluorescent Readout) #7744. Panel A shows images that were acquired using the LI-COR® Biosciences Odyssey® imaging system. Panel B shows quantification of results. Pixel intensity was quantified using Array Vision software. Figure 3. HT-29 cells were grown to 80% confluency and then either untreated or UV-irradiated and allowed to recover for 60 min. Cell extracts were prepared and analyzed using the PathScan® Intracellular Signaling Array Kit (Fluorescent Readout) #7744. Panel A shows images that were acquired using the LI-COR® Biosciences Odyssey® imaging system. Panel B shows quantification of results. Pixel intensity was quantified using Array Vision software. Figure 4. HeLa cells were grown to 90% confluency and then either untreated or treated with Staurosporine #9953 (1 μM, 3.5 hr). Cell extracts were prepared and analyzed using the PathScan® Intracellular Signaling Array Kit (Fluorescent Readout) #7744. Panel A shows images that were acquired using the LI-COR® Biosciences Odyssey® imaging system. Panel B shows quantification of results. Pixel intensity was quantified using Array Vision software. Figure 5. NIH/3T3 cells were grown to 85% confluency and then serum starved overnight. Cells were treated with Human Platelet-Derived Growth Factor BB (hPDGF-BB) #8912 (100 ng/ml) for the indicated time periods and cell extracts were prepared and analyzed using the PathScan® Intracellular Signaling Array Kit (Fluorescent Readout). Images were acquired using the LI-COR® Biosciences Odyssey® imaging system. Pixel intensity was quantified using Array Vision software. Heatmap analysis was generated using MeV analysis software. The PathScan® Intracellular Signaling Array Kit (Fluorescent Readout) is a slide-based antibody array founded upon the sandwich immunoassay principle. 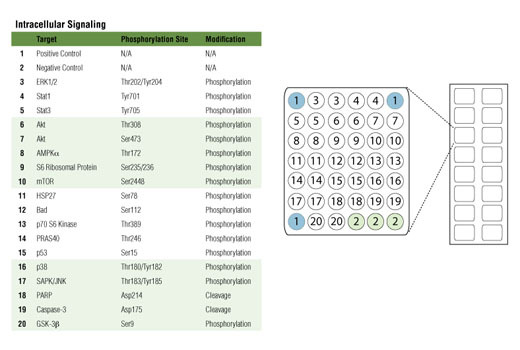 The array kit allows for the simultaneous detection of 18 important and well-characterized signaling molecules when phosphorylated or cleaved. Target-specific capture antibodies have been spotted in duplicate onto nitrocellulose-coated glass slides. Each kit contains two 16-pad slides, allowing the user to test up to 32 samples and generate 576 data points in a single experiment. Cell lysate is incubated on the slide followed by a biotinylated detection antibody cocktail. Streptavidin-conjugated DyLight® 680 is then used to visualize the bound detection antibody. A fluorescent image of the slide can then be captured with a digital imaging system and spot intensities quantified using array analysis software. PathScan® Intracellular Signaling Array Kit (Fluorescent Readout) detects the indicated cellular proteins and signaling nodes only when phosphorylated or cleaved at the specified residues. (see Array Target Map). No significant cross-reactivity has been observed between targets. This kit is optimized for cell lysates diluted to a total protein concentration between 0.2 and 1 mg/ml (see kit protocol). Phosphorylation and proteolysis are two widespread covalent post-translational modifications that represent important regulatory mechanisms in biology. Detection of these modifications on a set of cellular proteins playing a well-understood role in cell biology can provide a broad snapshot of intracellular signaling. 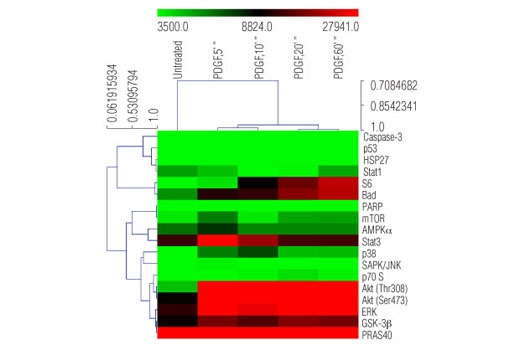 The MAPK/Erk cascade is one of the best characterized and widely studied signaling modules. It is involved in a broad range of cellular processes such as proliferation, differentiation, and motility. MAPK/Erk is activated by a wide range of extracellular signals including growth factors, cytokines, hormones, and neurotransmitters. It is activated by dual phosphorylation at Thr202 and Tyr204 by the dual specificity kinases MEK1 and MEK2. p38 and JNK MAPKs are core components of two additional structurally related signal transduction modules. 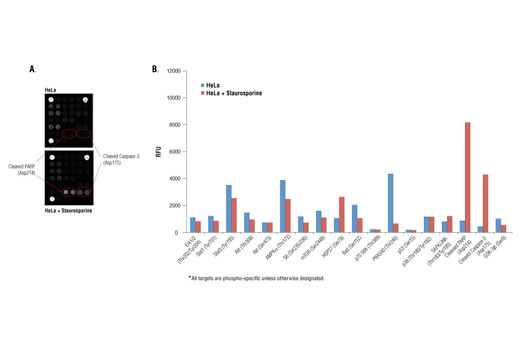 p38 and JNK are activated through a similar dual phosphorylation mechanism by various MAPK kinases in response to pro-inflammatory cytokines, stressful conditions, or genotoxicity. Stat1 and Stat3 are important signaling molecules that are involved in immunity and inflammation and can be activated by a variety of cytokines or growth factors. Stat1 and Stat3 are phosphorylated at Tyr701 or Tyr705, respectively, by cytokine receptor-tethered tyrosine kinases of the Jak family or, in some cases, by other tyrosine kinases such as Src. Akt is a protein kinase generally activated in response to growth factor stimulation that transmits growth and survival signals. Phosphorylation of Akt at Ser473 and Thr308 by TORC2 complex and PDK1, respectively, are reliable predictors of Akt activation. Phosphorylation of PRAS40 at Thr246 by Akt relieves PRAS40 inhibition of TORC1. 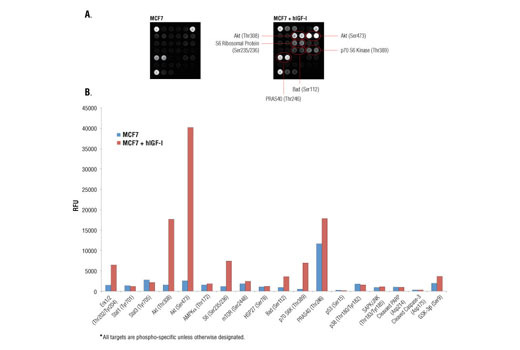 Akt phosphorylation of the pro-apoptotic protein Bad at Ser112 and the multifunctional kinase GSK-3β at Ser9 inhibits their activity and promotes cell survival. mTOR is an important signaling hub that is a major component of two macromolecular complexes, TORC1 and TORC2. mTOR is phosphorylated at Ser2448 and integrates growth factor signaling and nutrient availability, thus playing an important role in cell growth and homeostasis. mTORC1 phosphorylates p70 S6 Kinase at Thr389, leading to kinase activation and cell cycle progression. The S6 ribosomal protein is found downstream of p70 S6 Kinase and its phosphorylation at Ser235/236 reflects mTOR pathway activation and predicts cell cycle progression. AMPK is an energy sensor that is activated by phosphorylation at Thr172 in response to elevated AMP levels. AMPK regulates fatty acid metabolism, as well as modulates protein synthesis and cell growth. HSP27 is a mediator of cell stress that confers resistance to adverse environmental change. HSP27 is phosphorylated at Ser78 within the p38 MAPK pathway. p53 plays an important role in cellular response to DNA damage and other genomic aberrations. Phosphorylation of p53 at Ser15 by ATM/ATR or DNA-PK in response to DNA damage leads to its stabilization and accumulation. Caspase-3 is a critical executor of apoptosis. Caspase-3 is activated by endoproteolytic cleavage at Asp175 and exerts its pro-apoptotic activity through cleavage of multiple cellular targets. PARP, an enzyme that is involved in DNA repair, is one of the main substrates of activated caspase-3. Cleavage at Asp214 leads to PARP inactivation. 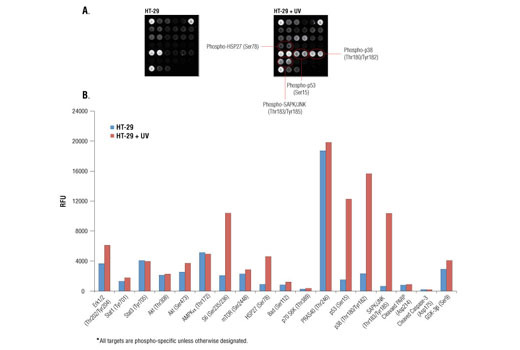 Increased levels of cleaved caspase-3 and cleaved PARP are reliable indicators of apoptosis. Huang, J. and Manning, B.D. (2009) Biochem Soc Trans 37, 217-22. Hardie, D.G. et al. (2012) Nat Rev Mol Cell Biol 13, 251-62. Keshet, Y. and Seger, R. (2010) Methods Mol Biol 661, 3-38. Cuadrado, A. and Nebreda, A.R. (2010) Biochem J 429, 403-17. Brognard, J. and Hunter, T. (2011) Curr Opin Genet Dev 21, 4-11. Hunter, T. (2009) Curr Opin Cell Biol 21, 140-6. Manning, G. et al. (2002) Science 298, 1912-34. Kurokawa, M. and Kornbluth, S. (2009) Cell 138, 838-54. Shi, Y. (2004) Cell 117, 855-8. Boatright, K.M. and Salvesen, G.S. (2003) Curr Opin Cell Biol 15, 725-31. Beyrakhova, K.A. et al. (2016) J Biol Chem 291, 15767-77.